← Happy International Day of the Girl! I got a large envelope filled with wonderful letters in the mail last week. 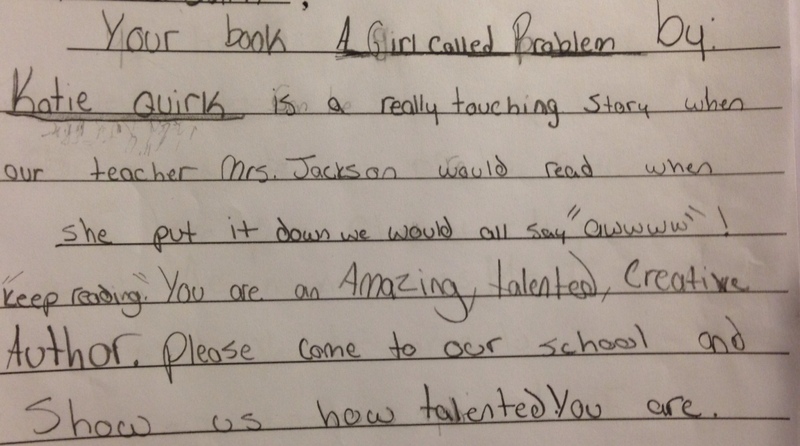 The authors of these letters were 5th-grade students in Ms. Jackson’s class at Old Town Elementary School here in Maine. Thanks so much for writing so many wonderful letters to me. What a treat it was to hear your impressions of A Girl Called Problem and to think about your many questions. 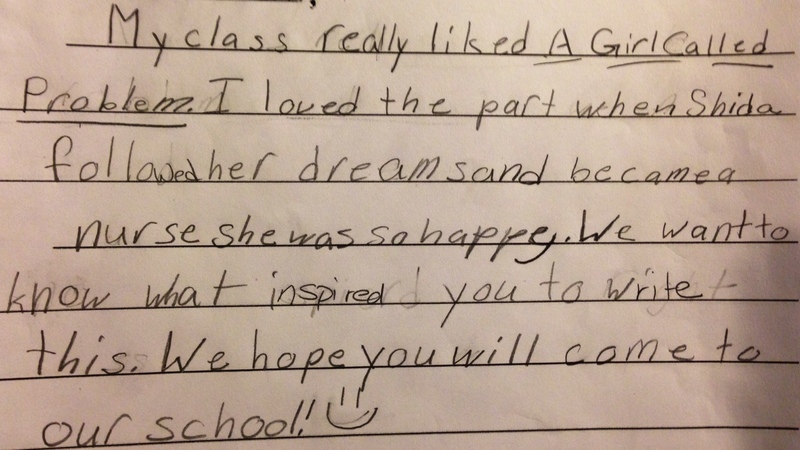 Julia, Robert, and Joseph all asked what my inspiration was for the book. I lived in Tanzania for two years and fell in love with the country then. I was frequently sick, and yet I still consider those two years some of the happiest of my life. Some of the things I enjoyed there were the rituals of collecting water, reading by candle light at night, learning the intricate Swahili greetings, getting to know people in the nearby rural village, and eating fresh mangos and papayas. Ask your teacher if you can take a peek at the book (or check it out from your local library) in order to read my author’s notes at the back of the book (p. 235). I get into the question of inspiration a bit there, too. Mallie asked about my inspiration for the names of characters. Believe it or not, I actually knew a girl named Shida in Tanzania. She was the daughter of a village tailor and she sometimes delivered clothes to my house. I never heard the story about why she had been named “Problem” but for years after meeting her I wondered. All of the other characters were named with words or names I encountered while in Tanzania, and I gave some of them names with meanings that seemed fitting (Furaha=Happiness; and Mrefu=Tall, as you know). Devan asked about the village of Litongo. It’s actually a made-up name. In fact, in an early draft of the book Shida’s home village was named Lawanima, which was the name of a real village I visited, but I figured that Lawanima was kind of a hard word for most non-Swahili-speakers to pronounce, so we changed it to Litongo. Summer and Micheal asked if I have written any other books. I am revising my second book right now. It’s actually a book written for an adult audience and it’s about two years I spent living in India, after I lived in Tanzania. Unlike A Girl Called Problem, it’s non-fiction. Alexis asked how long it took me to write A Girl Called Problem, and the answer is complicated. One simple answer is that I started my first draft six years before the book actually came out in print. Pretty amazing, huh? The book went through several drafts, each one slightly better than the last. When my writer friends and I had run out of ways to improve the manuscript, I went on to find an agent. Once I found an agent, she had to find a publisher who was interested in buying the book. Once we sold the book to the publisher, then my editor at the publishing house and I did more revisions and thought about things like cover art, glossary pictures, and other details, and then the book finally came out. As you can see, it’s an involved process! Why is Shida’s life so tough? In your letters, many of you mentioned the hardships Shida faced. Blake and Jamie wondered why people were unkind to Shida, especially her own mother, and Ethan mentioned the death that happened (I won’t mention the character’s name just in case someone reads this who hasn’t yet read the novel). Readers often ask me why these tough things had to happen, which is a great question. Part of the answer, in my mind, is that good stories often involve transformation of the main character—in other words, she is changed in some permanent way because of her experiences. Though we are certainly changed by positive experiences, hardship also really helps to define who we become (and it also makes for interesting stories). Shida faced many hardships throughout the book, but she always persevered. I would be curious to hear how you think she changed as a character by the end of the book. Zoey, Kayla, and Sierra each mentioned specific parts of the book that you enjoyed, including the methods Shida used to heal Furaha, and Mama Malongo’s redemption at the end of the book. I’m so glad that you mentioned Mama Malongo, Sierra. I think that’s one of my favorite parts of the book as well. It’s an example of how a person who is assumed to be bad or evil is, in fact, just a victim of mistreatment by others. And, finally, some of the grizzly details of the story: Darian asked if malaria is real. Yes, it absolutely is. In fact, until about 1950, it was a disease people contracted in some parts of the United States. I was diagnosed with and treated for malaria several times while I lived in Tanzania, and most people I knew there had lost a brother or sister to the disease when they were younger. Researchers are working on a vaccine for malaria, which would be wonderful, but none have become available to the public yet. Merian, Alysa, Tiffany, and Tyler, and many others wanted to know more about the siafu ants. Yes, they are real and, yes, I stepped on them many times, unfortunately. If you saw just one siafu ant, then you’d assume it to be quite harmless, but they travel in rivers of thousands of ants. By daylight, instinct would tell you not to step on one of these rivers. The trick for me in Tanzania with siafu ants was nights: the electricity was often out and if there was no moon and I was walking outside in the dark, I couldn’t see these ant rivers and was libel to step on them. As you know from Gervas’ experience, the ants initially swarm up the victim’s body, unbeknownst to them, and then several minutes later they all bite at once. How does it feel? Worse than a black fly bite, but not as bad as a bee sting—the only problem is that you get MANY bites. I always wondered how the ants all knew to start biting at once and I finally looked it up. Apparently, they send out some pheromone (chemical smell) that they can smell and we can’t. That is their way of telling each other, “On the count of three: one, two, three, BITE! And, finally, Joseph, I agree that Gervas deserves a spankin’. In fact, physical punishment is still quite common in Tanzania, even in schools, so if Gervas were a real kid living in Tanzania today he’d probably get several spankings! I hope these answers are helpful. Thanks so much for your letters and for reading A Girl Called Problem. And, in answer to your many generous offers to come to your school, thank you. I would love to! It sounds like Ms. Jackson and others are working to make a visit happen. 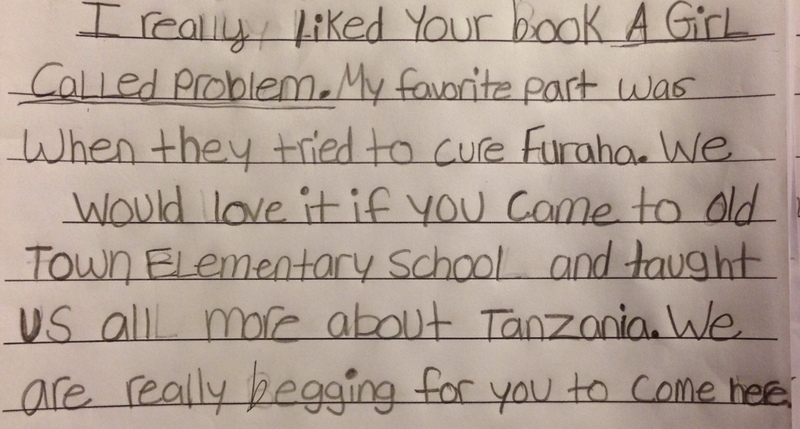 This entry was posted in A Girl Called Problem and tagged A Girl Called Problem, Katie Quirk, Maine Writing Project, Middle Grade Novel, Ms. Jackson, Old Town Elementary School, Tanzania. Bookmark the permalink.